The Propeller Galaxy (NGC 7479) is a barred spiral galaxy located about 105 million light-years away from Earth in the northern constellation of Pegasus (the Winged Horse), while it is racing away from us at some 2381 kilometers per second. It has a very asymmetric spiral structure with a bright, long bar. Its tightly wound arms create an inverted ‘S’, as they spin in an anticlockwise direction. However, at radio wavelengths, it spins the other way, with a jet of radiation that bends in the opposite direction to the stars and dust in the arms of the galaxy. This radio jet in the Propeller Galaxy was probably put into its bizarre backwards spin by a recent minor merger with another galaxy. 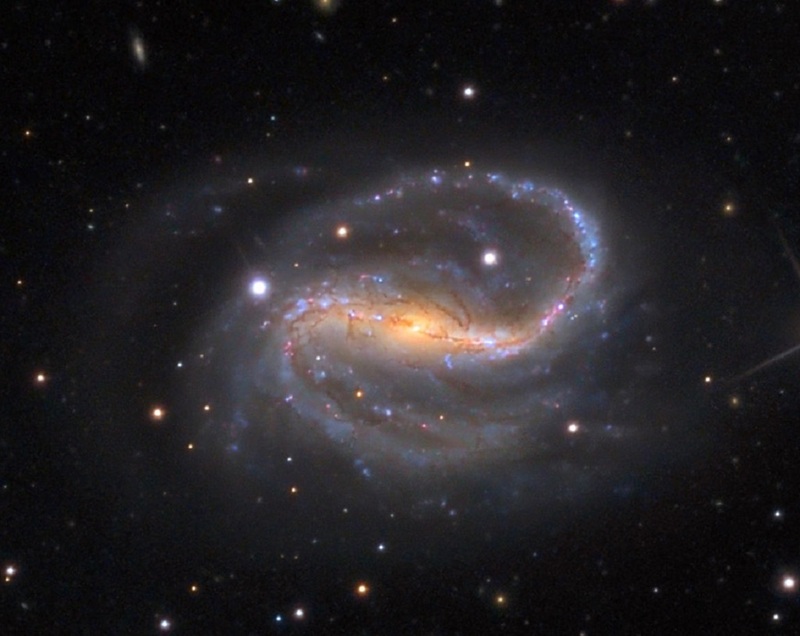 Star formation is reignited by galactic collisions, and indeed NGC 7479 is undergoing starburst activity, with many bright, young stars visible in the spiral arms and disk. The brightest stars in this image, however, are foreground stars — caught on camera because they lie between the galaxy and the Earth. NGC 7479 is also classified as a Seyfert galaxy, a galaxy with an extremely bright, active galactic nucleus (AGN), that contains a supermassive black hole. Two supernovae occurred in the Propeller Galaxy: SN 1990U that reached mag 16, was discovered on July 27, 1990, and SN 2009jf with a maximum brightness of mag 15, was discovered on September 27,2009 by the Lick Observatory Supernova Search. Both were Type Ib supernovae, caused by the core collapse of massive stars, and usually referred to as stripped core-collapse supernovae. These stars have shed (or been stripped of) their outer envelope of hydrogen. This galaxy is easily visible in moderate telescopes as an elongated fuzzy patch of light. The spiral arms can be seen with more difficulty in larger telescopes under dark conditions. This picture was created by images taken during September 5th – 10th 2010 with a SBIG STL11000 CCD Camera on the 32-inch Schulman Telescope (RCOS) at the Mount Lemmon SkyCenter.